Paul Silcock, New Zealand Tree Grower February 2009. In April last year a sawing study was carried out on a stand of coastal redwood in Mangatu forest. 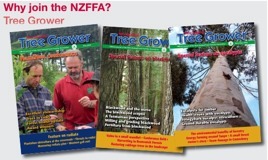 Details of the study’s methods and aims can be found in an article in the August 2008 issue of Tree Grower. This article provides a brief overview of some of the results from the study. The full reports detailing both the sawing and wood quality studies are currently being reviewed and will be available through Future Forests Research. Isolate the log and tree features that relate to gross value extraction at the timber level. 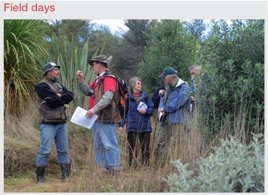 The trees for this trial were selected from a small coastal redwood stand in Mangatu Forest near Gisborne. The stand was 38 years old, had been pruned four times to a height of six metres and thinned twice, down to a stocking of 398 stems per hectare. The standing basal area of the stand was 107.6 cubic metres. A total of 13 trees were selected from the stand to be included in this study. These trees were cut into 50 logs, 13 of which were pruned logs. A base-line sawing study was carried out on the logs at Waiariki sawmill in Rotorua. The trees, logs and timber were all tracked through the process allowing the origin of each piece of timber to be traced back to its parent tree. The following points outline the key findings from the study. The three components most important in determining log value in redwood are log size or small end diameter, pruned quality, heartwood content and to a lesser extent, branch status. Other random defects such as rot and resin pockets also affect the value, although these are almost impossible to predict in the log form. The gross timber return from the 50 logs was US$7,835. The pruned logs made up half of this value while only representing 38 per cent of the volume. The pruned quality as judged by the pruned log index (PLI) was relatively low, ranging from 1.4 to 7.6. This had an effect on the amount of clear timber that was produced. Only 12 per cent of all the timber was graded as clear which comprised 32 per cent of the pruned timber. However the two logs with PLIs of greater than seven produced 52 per cent clear timber by volume. Despite the relatively low PLI scores the relationships between PLI and percentage of clear timber and pruned log value extraction are relatively strong. Therefore PLI seems a robust measure of the pruned log quality in redwood. As the data of the sawn pruned redwood logs grows, an index could be developed that includes heartwood which could prove even more valuable than PLI alone. These PLI scores were much lower than what would be expected from a stand under modern management. There is some evidence that this may not be due to poor pruning timing but the growth of the epicormic shoots into branches. The presence of the pruned epicormic shoots at the base of the tree has seriously affected the volume of all clear heartwood that could be produced, especially so in some of the trees where there appeared to be two defect cores. The amount of heartwood timber from a log is important for value in redwood. However the relationships between externally measured heartwood log parameters such as heartwood small end diameter and heartwood volume were not good at predicting percentage of timber with greater than 90 per cent heartwood. This is most likely to do with the variability of shape of the heartwood cylinder inside the log. Understanding the physiological mechanism that causes this variability in heartwood diameter would seem to be an important research question. The value decrease due to dead branches was not as marked as expected. The categorisations during the tree selection into three groups, of trees with green branches, trees with small dead branches and trees with large dead branches, did not provide an accurate indication of likely grade out-turn of timber from those trees. Further work on crown and branch dynamics is needed. This requires an understanding of the relationships between branch death and time until bark encased knots are formed will provide better management decisions and grade out-turn in the upper logs. Large resin pockets were found in the timber. However the presence of resin pockets only downgraded clear appearance grades, so there was little effect on the value. Rot and insect damage were both present in the sample where rot caused an estimated loss in value of $588 or seven per cent. For the pruned logs, the 3D log profiles, and the sawmilling defect information is used to calculate the PLI. The PLI is defined as a measure of basic clear wood potential. It does not include randomly occurring defects such as resin pockets. PLI was original developed for radiata pine. Defect core is a description of the pruned knotty core applicable only to sawlogs. It is defined as the cylinder inside the log which contains the pith, pruned branch stubs and occlusion scars. The size of this core is expressed by a mean of the two diameters measured at right angles. The graph shows the PLI for each of the pruned logs. Due to the short length of the pruned log of 3.9 metres from tree six, a PLI could not be calculated. The study showed that pruning quality carried out on the selected trees varied considerably. It was shown that epicormic shoots developing into branches between the third and fourth pruning lift created a second defect core which affected the diameter of occlusion and therefore the PLI. Future management would be targeting a PLI of 7.6 or greater which is considered satisfactory for radiata pine. The illustrations show the grade out-turn for the pruned logs and unpruned log separately. Very little timber was graded as clear all heart. All heart needs be 100 per cent heartwood and saw operators were instructed to minimise docking to provide for appropriate data collection for the study. With some appropriate docking and edging of these boards there is the potential to substantially increase the amount of the clear all heart and clear heart by transferring volume from clear commons into these more valuable clear grades. Large resin pockets were detected on 43 of the 766 boards. They did not occur in every tree and there was considerable tree-to-tree variation. The photograph shows the bird’s eye effect of epicormic shoots in timber. These buds have the potential to develop into full sized branches, undoing any pruning investment by downgrading what would have been clearwood. In the 13 trees sampled the average occlusion width was 7.7 mm, the average defect core diameter was 305 mm and the average defect core expressed as a percent of the diameter at breast height was 60 per cent. The size of the defect core, often termed diameter over occlusion, is affected by aspects additional to silvicultural treatment. This can be where tree level characteristics such as branch collar dynamics and bark thickness, and growth rate at time of pruning will have an effect on occlusion rates and therefore clear heartwood return. Despite the large average defect cores found in the sample trees, the average occlusion rate of 7.7mm was remarkably rapid. In the photograph it can be seen that a branch which was pruned halfway through the growing season A, is fully occluded by the middle of the following growing season B.
Staining, rot and insect damage were all present at some level in all logs. The three photographs show examples of all three of these defects. The level of stain was not measured during the grading as it appeared that staining was not a precursor to rot. The majority of the trees in the stand have large sections of dead branches in the mid-portion of the stem. In the top logs dead and rotten branches are a potential problem, which leads to questions around silviculture and management of the green crown. At the tree selection stage of this study each tree was categorised as either green branches, small dead branches or large dead branches. These categorisations relate to the middle section of the stem. The percentages of dead and rotten knots found in the timber cut from each tree branch are – green branches 28 per cent, small dead branches 40 per cent and large dead branches 25 per cent. The interesting result is the low percentage of dead and rotten knots in the trees classified as large dead branches when compared to the trees with green branches. The graph shows the effect that small end diameter and percentage of dead and rotten braches have on the gross value per cubic metre where gross value per cubic metre increases with small end diameter and decreases with increasing dead and rotten knots. This study carried out in Mangatu has provided a newly created database on measured log variables, conversion and timber grade recoveries per log. The log and tree features that relate to gross value extraction at the timber level have been analysed to develop indices of critical log variables and to generate provisional relationships between those measures and each of grade out-turn and value. The provisional relationships derived have been used to construct prototype log value models which are expected to be adjusted and enhanced by results from further studies on redwoods which may follow over the next few years. Pruned log index has been shown to provide an appropriate measure of basic pruned redwood log quality.